The week before and the week of Christmas is one of the busiest travel times of the year. 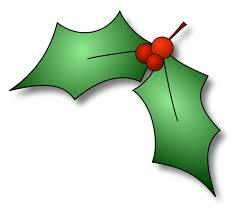 You may be traveling great distance to see your family and friends – planes, trains or automobiles. We try to remind and educate our readers, especially during the more traveled months, how important it is to wear Travel Socks or Travel Stockings for the health of your legs, especially when you travel long distance. If you suffer from the contributing factors of vein disease, you could be a RISK for developing (Life-Threatening) conditions like deep vein thrombosis (DVT) and even a pulmonary embolism. One in 10 people who travel (long distance flights) develop blood clots according to scientists, (sitting still for long periods increase risk). Typically, blood clots that form within a superficial vein dissolve by themselves. However, blood clots that develop within a deep vein are a cause for concern, because if a piece of the clot, breaks free, it can travel through your bloodstream and to your lungs to cause a “pulmonary embolism” and block your blood flow. In about 50% of cases there is no warning signs that a DVT or Pulmonary embolism is occurring. Either can result in sudden death. We want this information to server as a crucial reminder to have any vein diseases evaluated and we recommend you contact your doctor before you travel for the holidays. Be proactive, If you’re planning a (long distance) trip, especially flying, for your health and well-being consider wearing of Travel socks or Travel stockings, to minimize the risk of embolisms and the risk of DVT. It's been suggested, even to continue to wear your Travel Support Stockings the next day after your arrival at your destination, to ensure your legs have good circulation. You may ask: What compression level is needed? 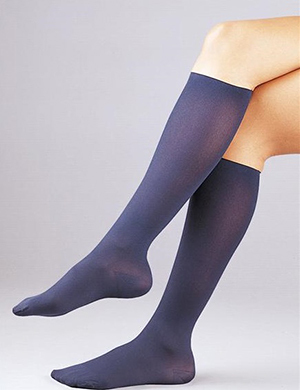 For individuals who have (no problems with circulation) in their legs - 15-20mmHg Travel Socks is adequate. 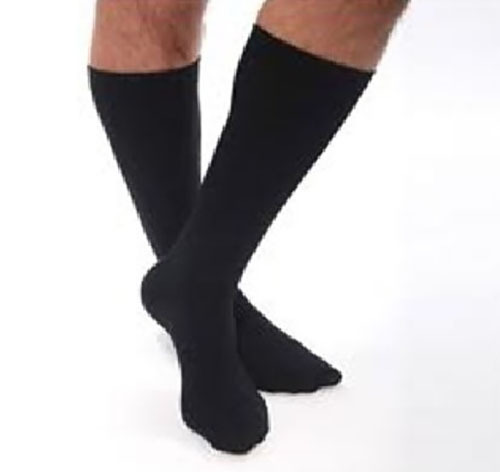 For individuals who already are pre-dignosed with venous leg problems - 20-30mmHg Travel Socks is a must. Below you can click on and check out a couple of our most popular selections of Travel Socks for your next long distance travel. Be Smart for your health & well being, Enjoy your travels!